It’s late, and we should all get back to our rooms for some sleep. But somehow, we know that, when this night ends, that magic thread of this crazy adventure will slip out our grip from the “now” into “remember when”. Where at that liminal point, like a waking sleeper whose dream is still close enough to hold, before the day intrudes and washes it away to faded memory. 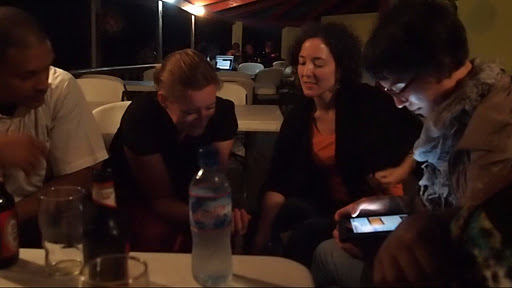 A dozen of us are squeezed in around one of the long folding tables on the covered balcony of the Krystal Ocean Hotel, drinking beer, swapping photos and stories of our time in the field, while the rain comes down in torrents. It’s like the last night at camp, and we’re huddled around the campfire, not wanting it to end. Susan’s been asked to stay on as an STO until the 18th. Cindy’s already agreed, and will be heading back out in the morning: Up country into Lofa and Bong Counties, further north than her last assignment. Another day out on the road, on those crazy roads. The rest of us have another day here to putter, catch up on hot showers, and contemplate our next move. For some, it’s back to the desk job; others are trying to squeeze a Skype call through the hotel’s trickling connection to interview for a short term spot doing logistics in Kabul, or further afield. We compared accommodations: Kim and Tereza “won”, with millipedes on the floor and rats getting territorial on their bed. No way to hang the mosquito net, and electricity to keep the fan going after 11 pm in the sweltering humid night up in Lofa County. They had good food, though: the Pakistani UN camp was legendary for its meals, and as international observers, they could get in. It was 1:00 a.m. and we all knew we really should turn in for the night. We kept saying so. And then Scott, or Kim, or Pete would say “Oh god, and when we stopped at the roadside stand for fried plantains, they were wrapped in Danish newspaper, and…”. And, and, and. And inexplicably, another hour washed away like red dirt in the rain on the street below.